Week #3 = June 23-28; Week #6 = July 14-19 Sunday 4:00pm through Friday 6:30pm. Your 6 days and 5 nights include all the classic fun and activities of regular Resident Camp but with the added FUN of living in the Wilson Creek Adventure Village! Explorer Camps are for “tough” campers who are comfortable living out-of-doors and ready for the next level of camp adventure. You will live in a Unit of 6-12 campers with 2-4 counselors in one of our creek-side Adventure Villages located in our vast and beautiful riparian forest. Each A.V. includes a boys’ hut, a girls’ hut and your dining shelter with fire circle and cooking grill, all by the clean waters of Wilson Creek. You’ll eat most meals in the Ark, swim in the pool, sleep on bunk beds with mattresses and personal screening (or bring your hammock! 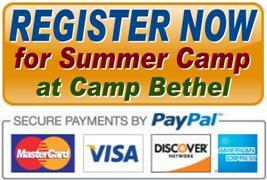 ), attend all-camp events, and have access to all the amenities and bathhouses of the camp. You and your unit will plan your week’s activities including group games, crafts, songs, Bible lessons, swimming, nature lessons and exploration, creek-play, hiking the camp trails, orienteering, parachute games, slacklining, GaGa Ball, 9-Square & 4-Square, 3 delicious meals, archery, and a day on the climbing wall and high ropes course including the Zip Line and the Flying Squirrel! Tuesday or Wednesday your family unit will have a cookout at your Adventure Village. This is a great week of spiritual development, fun and adventure; exploring your extraordinary faith journey and learning TOGETHER about our "Boundless Belief: God's Universe." For an additional fee (billed to you later), choose one of the available "add-on" adventure activities for your chosen dates, (see list and dates below). Be here for an awesome week!